Last Thursday eve we were invited to attend Meatball Madness, the kickoff event of the New York City Wine & Food Festival. Hosted by the flawless Giada De Laurentis, we'd like to re-title this meaty extravaganza, "the ultimate omnivore's throw down." 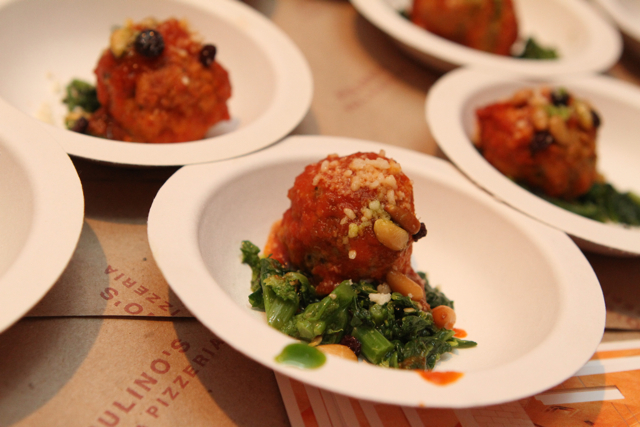 30 of New York's top chefs rolled up their sleeves to create some of the most deliciously concentric meatballs we've ever tasted. While some steered away from the Italian approach, each presentation tasted like a true culinary paean to Italian nonna's everywhere. As we write this, we might unbutton our pants a notch (if it's alright with you), because we sampled more meatballs in one evening than we could have ever imagined, and we still want more. 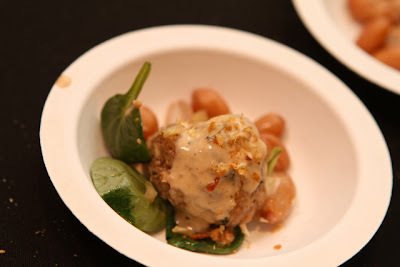 While all of the meatballs were delicious, we were star-stuck, or rather meat-struck, at chef Harold Dieterle's Kin Shop creation: fork-tender goat meatballs (that grabbed third place), coated in a bright, spicy, creamy Tatsoi Penang curry sauce speckled with boiled peanuts. Nolita's neighborhood hub, Rubirosa, made a nod to the Italian tradition with a seriously succulent creation, served on top of a bed of homemade pasta in the lightest marinara sauce worthy of its neighborhood's culinary history. And who could forget those gorgeously rich rabbit meatballs from Maialino or Fedora's salty sweet chicken meatball paired up with maple rice and crisp briny pickles. Little Owl's Chef Joey Campanaro swept away the winners circle in first place with his comfort filled gravy meatball slider, garnished with crisp dandelion greens and fennel salad on a crusty cheese clad bun that had us going for seconds... and thirds. To refresh our palettes between nibbling sessions, we took to libations. 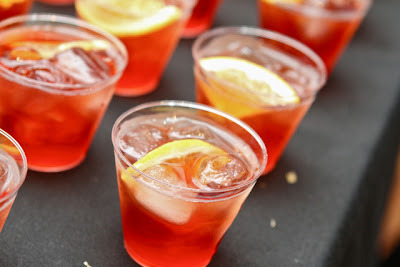 We should preface that it's no secret we're big fans of the cocktail, in love with Campari, and swoon upon hearing "Negroni," so it comes as no surprise that we were dazzled upon discovering the ultimate boozy oasis, commanded by our favorite spirit, Campari. One of our favorite NYC bartenders, Richie Boccato, shook up the classic Negroni, a liquid ruby in both taste and appearance that was gorgeously tangy, bitter and sweet in one sip. Just when we thought a change to tradition couldn't get any better, the Cooking Channel's cocktail aficionado, Darryl Robinson, stirred up a spin on the classic Negroni with its fizzy sister, Negroni Sbagliato. An effervescent knockout, this Campari and Sweet Vermouth combo soared with a kiss of Prosecco and a twist of citrus. We spotted the Meatball Madness Queen, Giada De Laurentis, sipping upon a glass as she served up her own Italian style meatballs. When the meatball hangover lifted, we jumped at the chance to find out the potion, er, recipes, for those Campari creations. Richie Boccato and Darryl Robinson were kind enough to let us in on their secrets. Herewith, a dram of inspiration for the next time cocktail hour strolls in. We guarantee that these recipes will steer you straight towards Italy upon every sip. But whatever you do, don't forget the ice. We're still feeling like we need to unbutton our pants a notch or two, but then again, we lived, "la doce vita," if only for an evening and would like to do it again, a.s.a.p.